This week I have been working on my Photoshop painting skills. 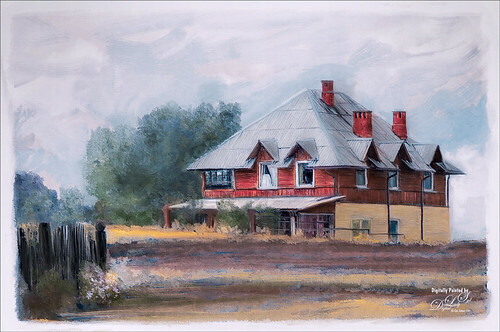 This painted image is of a group of apartment homes on a highway just outside Minsk, Belarus. I love all the classic geometric shapes in this image to give it a very interesting feel. I have not painted recently so this image was used to go try out the techniques of one of my favorite Photoshop gurus, Jack Davis, and his wonderful free Davis-Mixer Painting Setup-Beta action (located in Jack’s Freebies section of FB). This action is a lot of fun to use and is somewhat similar to the Mixer Brush Cloning Paint Setup action that comes with Photoshop. His various techniques are presented in his wonder Creative Live videos called Painting with Adobe Photoshop, but watch his Adobe MAX: Expressive Painting in Photoshop for a quick overview (need to zoom through to get to this Mixer Brush action technique). Basically just followed his steps and finished up with a few adjustment layers to adjust color and contrast. And yes, the Grut FX Cloud Brushes were used in this image! That was it. It takes quite a while to paint an image of this size, but it is also very creative and relaxing to do. And do not get upset if it looks awful for quite a while – it all pulls together at the end. Sort of an amazing process! 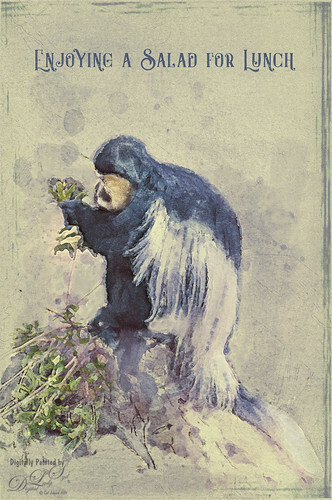 This painted image was taken in Belarus at a Farm near a Local Art and Zoo facility in the countryside. This image also used the same action as above. Topaz (see my Tidbits Blog sidebar for website link) ReStyle was used to set the color palette just right. There are so many steps in this action do not many steps was done afterwards. Jack’s provided brushes were also used in both images although one from Melissa Gallo was used for to get the nice foliage effect. There are a few tips and tricks that Jack has in his Creative Live videos that really help with the overall effect. Once again, it took quite a while to get the final result. For more examples of Jack’s technique, check out my Can You Get a Painting Look With a Photoshop Action? Jack Davis Can! blog. Also another example of the above action using a flower image can be see at my Tidbits Blog called Jack Davis Painting Action Really Works! He has 12 different actions in the download to get different effects in his Action so check it out. And he supplies you with all the brushes needed to use these actions. Decided to take this week off from serious blogging so just posting the same pix with some different filters applied. This image was taken a while back at a Turkey Run held in Daytona Beach at the International Speedway center field the day after Thanksgiving. I believe they have a new location on Beach Street. 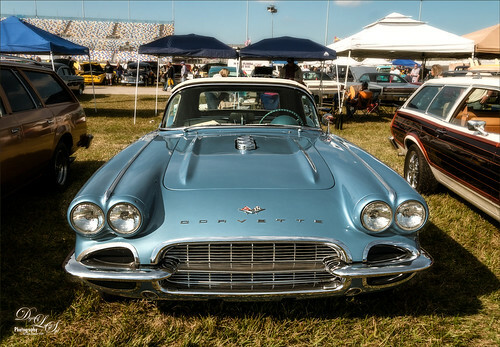 Since I am a big corvette fan, I had to take a lot of pix of them and this was one of them. 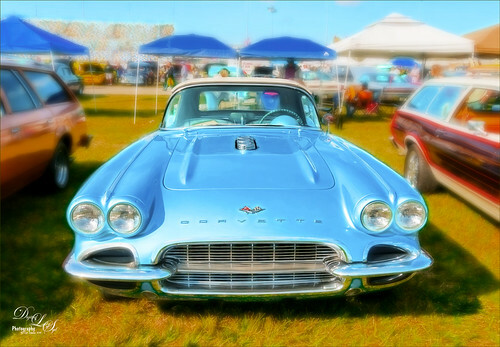 The above image results followed a little written Topaz Labs blog by Jodi L. Robbins called Auto Shine Tutorial with Topaz Glow 2. Very simple steps to follow and it creates a nice preset for the recently updated (and free if you already own) Topaz (see sidebar at my Tidbits Blog for website link) Glow 2 to use on with cars, boats and motorcycles. On a stamped layer (CTRL+ALT+SHIFT+E) above, Topaz Lens Effects’ Diffusion filter was opened and sliders set to Softness 0.32, Diffusion 0.63, and Edge Transition 0.35. Back n Photoshop a layer mask was added and the car was completely painted out so the Glow effect was totally removed there and just a little in the foreground area. A Black and White Adjustment Layer was added on top and set to Luminosity blend mode to further enhance the focal point. That was all that was done. I really like the beautiful vivid color with the soft look of the whole image. 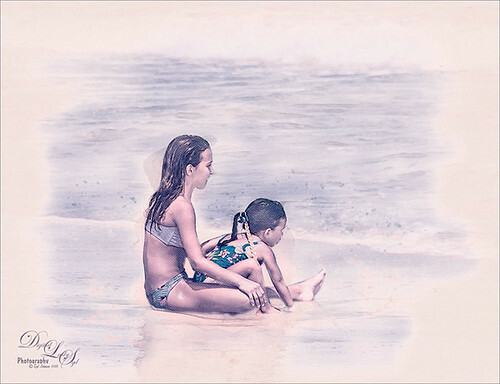 This image used On1 Effects 10 (see sidebar at my Tidbits Blog for website link), and it looks really natural! Created these nice results by following a video, this time by Blake Rudis called ON1 Short Clip – The Preset Workflow Trick. I am finding that by downloading his preset and using it as a starting point, a really nice sharp image results. In the plug-in, the On1 Glow effect was masked off the car to keep it in sharp focus.That is all that was done to this image! 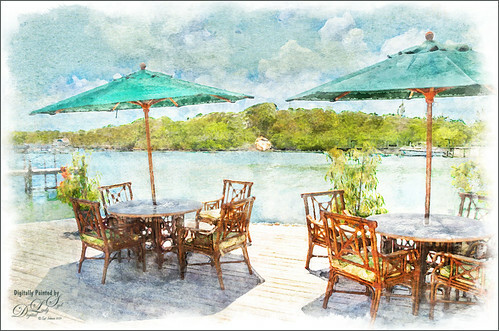 This image used a free Photoshop action called FX Paint and Sketch Action – using only the sketch action. The action layer was duplicated and the layer mask was applied and set to Multiply blend mode. The bottom background layer was duplicated and a Gaussian Blur with a Radius set to 112 was set just above it. That is all that was done – once again a very simple process! I was really surprised by the interesting tint effect that appeared in the image. Since I am reorganizing my office this week and probably next week, I am just posting a short blog. I found a free action set from Gavin Phillips that is pretty nice and thought I would share it with you. 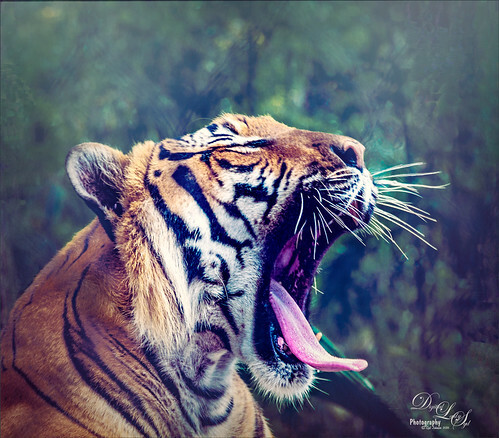 This beautiful Malayan Tiger was actually yawning at the West Palm Beach Zoo – this was the coolest large cat I have ever seen! He spent a lot of time posing for my camera as I was the only one standing there! Very entertaining! Used Gavin Phillips free Elegance Action (go to Free Downloads tab and select Free Actions in drop-down) – Gavin is an Action Master! This is a fairly long action that creates several adjustment layers to get the final effect. Mainly removed the Haze mists off the tiger by painting in its layer mask – otherwise not much adjustment in the action layers. Above the action group, a Selective Color Adjustment Layer was used to turn the background into a more cyan color. Topaz (see sidebar at my Tidbits Blog for website link) Texture Effects’s Crisp Morning Run preset (one of my favorites) was added on a stamped layer (CTRL+ALT+SHIFT+E) and just the Texture, Light Leaks and Split Tone sections were used – then a Vignette was added. Nik Viveza 2 (now free) was used to emphasize the face and tongue area. The whiskers were cleaned up using Kyle’s free Animator Pencil. That was it! Love the color and texture in this image. 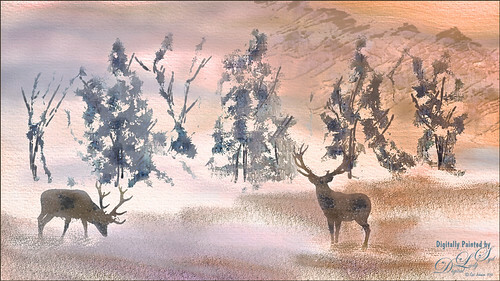 This image was painted in Corel Painter to begin with using Karen Bonaker Digital Art Academy‘s great tutorial called Sumi-E Secrets so it is not exactly an original. It was fun to try this technique and it was so much fun to paint! When you buy her tutorials, she gives you everything you need including videos, Brushes and Papers that may be required to get the effects, including the deer in this case. I liked the original image at this point, but since I am always trying out different ways to get a little different look, the last iteration of the file in Painter was saved as a PSD file and brought into Photoshop. Then a few special effects like snow and a little glitter was added for the wintry effect. Now Gavin’s Natural Light action was applied as is – it contained 6 layers that can be adjusted. It gave the image a little more of a dreamy soft sunset look. These purple flowers were taken at the Harry P. Leu Gardens at Orlando, Florida. This was a pretty simple workflow – once the image was brought into Photoshop, Gavin’s Elegance action was run again – I really like the results of this action. Several of the layers were adjusted in the action, but nothing major. Next Viveza 2 was used to add emphasis correctly on the flowers. I really like the effect created by this action. 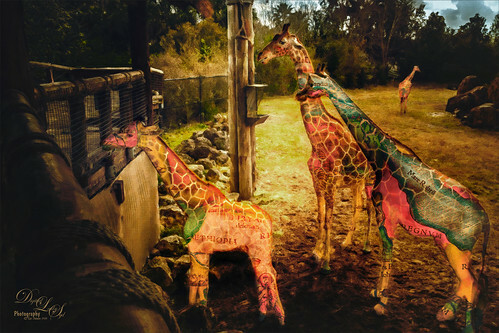 Here are my wonderful Jacksonville Zoo giraffes again, this time showing a rather different effect using a Photoshop Action. 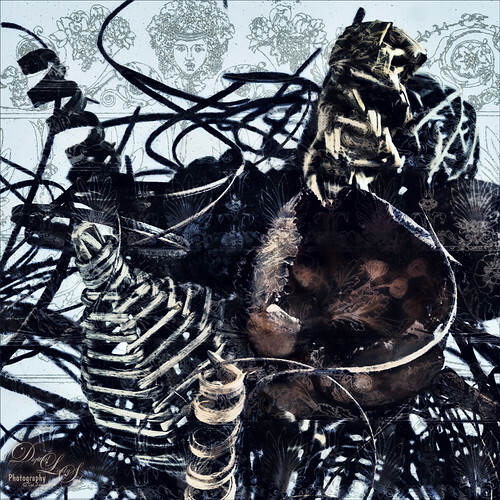 It was created by adding an old colorful African Map from 1584 onto their bodies with a wonderful, currently free, set of actions from Pretty Actions called Double Exposure Collection. (To download, need to Join their Facebook group and the link will become available – see the Double Exposure Photoshop Actions Tutorial video for tips on using the action.) I do not use a lot of actions in my workflow, but they can really be helpful and save a lot of time. This is the case with this action – it could all be done manually, but Pretty Actions has come up with some quick steps to speed up the process and give you lots of choices to finalize the effect. The basic double exposure actions allow you to open your image, and then add a different one to use for blending into the image along with layer masks. 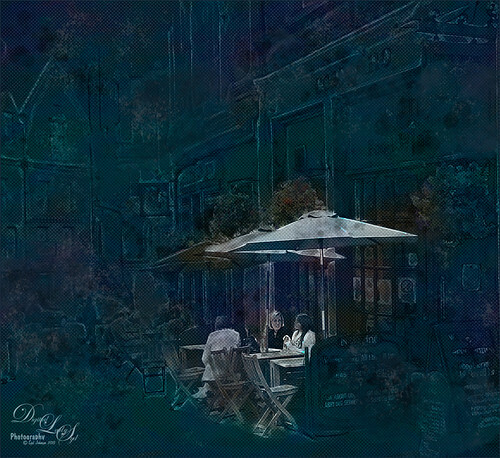 Several Levels adjustment layers are provided to add to the effect – Matte, Make It Cool, and Add Contrast were used in the above. All these layers can be adjusted by using the blend modes and layer opacities. In addition, I clipped a Hue/Saturation adjustment layer (ALT+Click between the layers) to get the colors of the map just right. A spotlight was set on the small giraffe’s head to highlight it just a little more (see my How To Add a Spot of Light blog from last week). Also a darken layer was used to emphasize some of the edges around the giraffe’s bodies (see my The Best Dodging and Burning Technique! blog). This image was taken of some basket-weave material shaped into flowers as a bouquet and is another example of what can be done with this action. The main flower seemed to be perfect to add a special effect using the same action as above. This time a texture was taken from EK Duncan’s My Fanciful Muse blog – Ackermann’s Repository (scroll down to last example-version 3). The texture layer was actually set to the Subtract blend mode and the Blend If sliders adjusted to get the correct effect. The texture layer was duplicated and still set to Subtract at 67% layer opacity, and then duplicated again and set to Multiply blend mode. Layer masks were used to adjust where the texture was applied. ON1 Effect 10 (see sidebar at my Tidbits Blog for website link) was used to add color and detail to the texture in the flower – an Adjustment Brush set to Vibrance was painted over the inside of the flower, and the HDR Look filter set to the Glow preset was used to sharpen details. On a New Layer, the Spot Healing Tool was used to clean up the image as a final step. I thought this turned our rather unique! A Pretty Fancy Carousel Horse! Just a quick blog this week. Decided to show the results of a rather fun inexpensive action I bought recently. 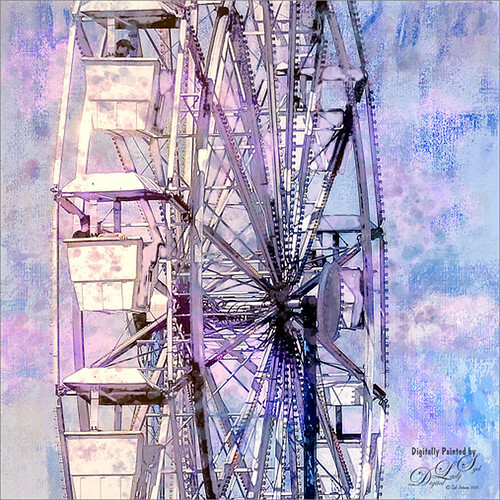 This ferris wheel image taken in Savannah, Georgia a while back and was one was my first attempts using the Mix Art Sketch (SS-MixArt) action. I have to admit it takes probably 10 minutes for my rather older computer to run the whole action, but afterwards there were lots of options that can be adjusted to get the sketch-like effect. Overall I love this action. It is compatible with CS3 and on. I added my own Corel Painter texture to the above image and used some of Kyle T. Webster’s wonderful Watercolor Brushes on separate layers on top to add some additional solid wash colors and splatters. Kyle may have the best Photoshop watercolor brushes around! I am still learning how to modify the different layers and layer masks to get the results I like. There are 9 layer groups that can be used on your image (Background Set, Background Elements, Main Focus, Engraving, Brushed Strokes, Paint Splash, Textures, Contrast Adjustments, and Color Adjustments). 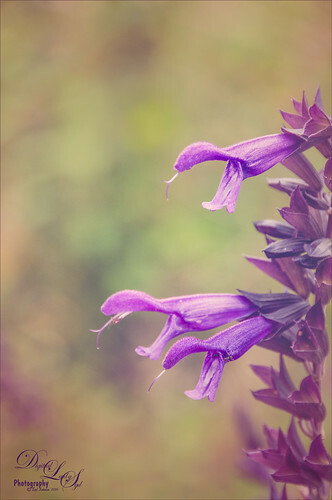 If you decide you like the group effect on the image, you can go in and adjust the individual layer opacities and blend modes, or change the adjustment layer opacities to get a more exact effect. 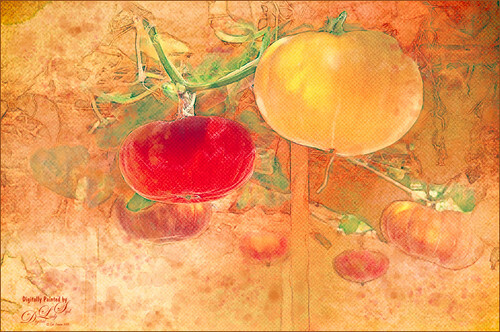 The tomato image used all but the Paint Splash group – instead two layers of Kyle T. Webster’s Real Watercolor Spatter Dense brush (my very favorite spatter brush) were added onto the image to give a more painterly effect. I also like the Texture Group’s half-tone pattern that can be added in the image. I call this image “Wave Watching” and it was taken on Daytona Beach, Florida. This same action was used. Just a lot of fiddling around with the different layer opacities and layer masks to get the effect I wanted. Some clean up was done on a separate layer. A Black and White Adjustment Layer set to Luminosity blend mode was added to get the exact color needed. A few more spatters using Kyle’s Real Watercolor Spatter brush on a separate top layer gave a little more texture to the water. Just another example of what can be done with this action using the same steps. Image taken in Edinburgh, Scotland on a warm day. I have been enjoying learning about several actions people have created that give some interesting twists to an image, and some are quite painterly. Last week I presented Part 1 on action based images, and this week Part 2 is a totally different kind of look also created with actions. 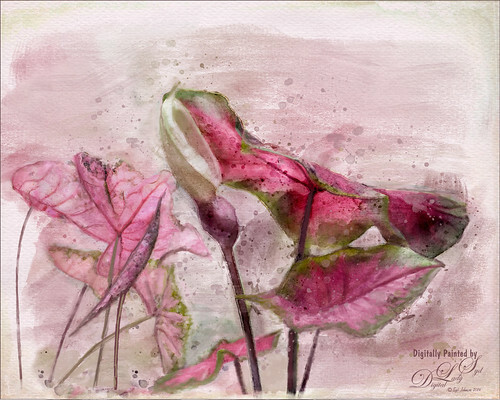 I have to thank Diana Day for the blog comment (here is a link to a beautiful flower image she created with the following set) that directed me to this little gem. 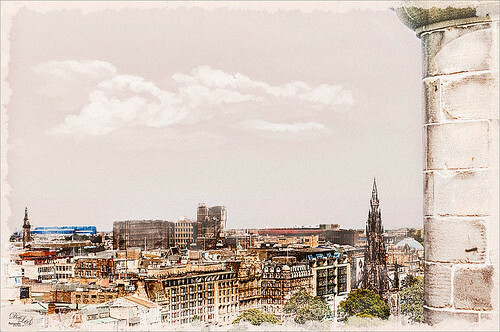 The above image was taken from Edinburgh Castle in Scotland.The Ultimate Artist packet is an inexpensive set ($7.50 at this time) provided by Scrap Girls, one of the really nice website that scrapbook hobbyists use. Besides the three actions provided, this packet also included three brushes (although you can use any of your brushes), six layer styles including one pattern for use in the styles and Pattern Adjustment Layers, two videos, and PDF instructions. I wanted to try a landscape so the Sepia Action was selected. The supplied Sketch brush was used to painted detail in the buildings but not the sky area. Following her suggestion in the videos, I copied the bottom original layer and moved it on top to add some color back into the image. This layer was set to Vivid Light at 59% opacity. On a New Layer some color was added into the image by painting with her Sketch brush. A Selective Color Adjustment Layer was added to get the colors exactly how I liked them, then set it to Darker Color blend mode at 77% layer opacity. Now the sky looked bad, so a cloud texture I had painted in Corel Painter were added for a more painterly feel. Any cloud brushes would also have worked. The sky color was changed back to a beige color as the blue just did not look right from the original. To do this a Hue/Saturation Adjustment Layer was clipped to the painted cloud layer and the city was painted back in the mask. Added a painted edge border on a New Layer on top – used the provided Sketch brush again to do this. Finally on a stamped layer (CTRL+ALT+SHIFT+E) Brandy’s Texture 2 layer style was applied. The pattern did not completely cover the image and left a line down the right side, so the Pattern Overlay Scale was changed to 165% and the Blend Mode was set to Multiply at 24% (from the default Overlay at 100%) to get a very subtle overall textured feel. I really like the supplied pattern for this effect. This image took a long time for me to get to a point that I liked. This image of my front yard yellow daisies that gives a very popular effect and is sold as an artistic effect in many stores. 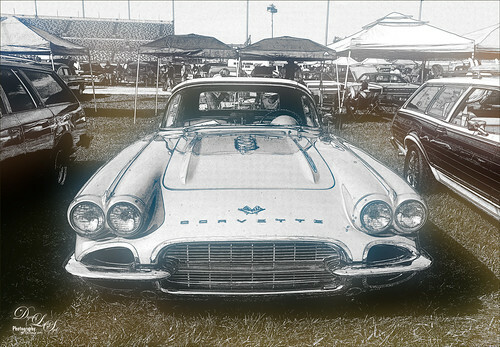 This image was cropped into a square and then the Color Action was run. The Watercolor Brush supplied was used to paint in the flowers on the action’s created black layer mask. When finished I decided to apply the layer mask so that I could add a texture behind the flowers that I painted in. The Outline Guide layer was turned off and Melissa Gallo’s beautiful Painted Texture April Pastel was brought in as layer under the flowers. French Kiss’s (see my Tidbits Blog for website link) Vintage French Recois overlay (the French writing) was placed over the flowers layer and set to a brownish color using a clipped Color Fill Adjustment Layer (CTRL+click between layers to clip). A layer mask was added to the lettering layer and it was lightly painted away from the flowers. Next I decided I wanted a more painted texture in the image so several New Layers were added using Creative Toons Watercolor brushes ( Creative Toons Watercolor Brushes – these were free from Photoshop Creative Magazine No. 113) on the different layers in different colors at different opacities. They were grouped to create just one layer look and set to 82% layer opacity. On a New Layer French Kiss Dot Grunge 04 was added and changed to a purplish color using same technique as the French Kiss overlay. Last step involved creating a watercolor border by painting around the edge of a layer with your favorite brush – the supplied brushes can do this easily. This was really a lot of fun to create and the package was very inexpensive. Just having some more fun with this little action set. 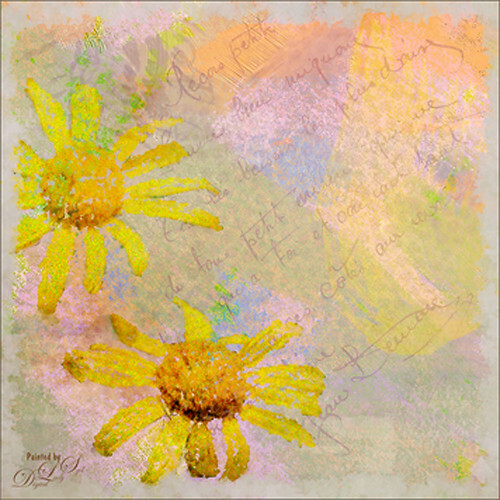 The flower followed basically the same actions and painting steps as above, just different Creative Toons Watercolor brushes. 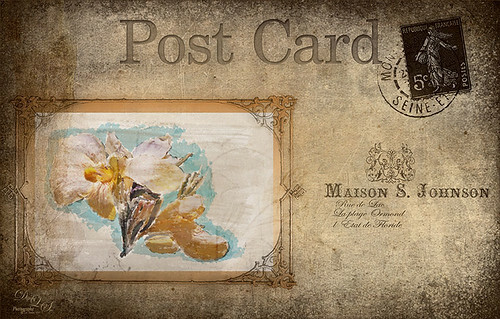 Next added the image to a beautiful free frame from Keep Designing.com called Antique Design Background and Rustic Frame and then Shadowhouse Creations free vintage Post Card Set 3-post card 3. Topaz (see sidebar at my Tidbits Blog for website link) ReStyle was used to really get the look I liked. The address is one of my overlays I created (see my How to Create Personal Overlays for Your Images blog) and the French stamp is from French Kiss Collections. This image really took a lot of fiddling around with to get it to all go together but it was lots of fun to do. After spending a large amount of time with these actions, I felt really nice effects can be achieved with them. The bottom two image worked out very well when flowers are used. But the landscape image turned out to be a lot of work and a lot of manipulation had to be done to achieve a look I liked – I believe I could do this same effect in some of my Photoshop plug-ins a lot easier and get a similar result. I discovered the watercolor brush to be especially nice, but you need to go into the Brush Panel and check the Spacing checkbox to see the stroke effect in the Preview box. I had trouble getting the nice watercolor effect she got in her videos so some of the brush parameters were adjusted. Remember that the Options Bar settings are sticky so check the opacity and flow settings – a wrong setting can give very different results. On her Watercolor Brush she has the Enable Airbrush-style Build Up turned on – this means that the paint builds up as you hold her Watercolor Brush in one place. (To turn on in a brush, check the Build Up section in the Brush Panel – it activates the Option Bar icon at the same time or just check the Options Bar icon.) Jack Davis uses this setting in his watercolor brushes but most do not use it. I got a little bit of edge difference so experiment with turning it on and off – and a mouse vs. a stylus can give very different results so play with these settings. And if your lines are not as scattered as hers, go in and change the scattering – check out the preview section and change the sliders to see what is happening. I got a really nice Scattering effect with this brush by setting the Scatter to 190% and the Count to 2. The Brush Panel can be very useful to help get the look you like. Also, if you find a brush you like, be sure to save it as a brush preset to use again – otherwise your settings are lost when you change brushes.